Super Savings Item! 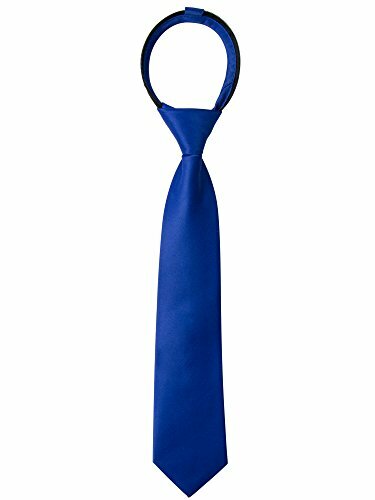 Save 39% on the Spring Notion Boys' Satin Zipper Neck Tie with Gift Box X-Large Royal Blue by Spring Notion at SCRHI. Hurry! Limited time offer. Offer valid only while supplies last. Pretied zipper tie. Easy to wear, even for kids. Just hold the tail of the tie and push the knot up to tighten. To loosen, just pull the knot down. PRETIED high quality solid color zipper necktie. Fully lined and easy to wear even for kids. Just hold the tail of the tie and push the knot up to tighten. To loosen, just pull the knot down. 100% Polyester. Dry clean only. SIZES (available in X-Small, Small, Medium, Large, X-Large). Perfect match with our satin bow tie ( B0183GKANE ) and pocket rounds ( B0185HEJZQ ). MATCHING ADULT TIES - For customers interested in adult size ties, we have Spring Notion Men's Solid Color Satin Microfiber Tie ( B01LXT837M ) that have colors closely resemble our boy's ties. Men's ties have a higher sheen than the boys' ties. Please refer to the side-by-side pictures for color comparison. SHIPPING - Orders of 4 or more ties that are fulfilled by Spring Notion will be shipped via USPS 2-Day Priority Service without extra shipping charges. Satisfaction guaranteed with free replacement or full refund.